Eniola Aluko says she can "absolutely" see a day when crowds of around 40,000 are the norm in women's football. The English striker played for Juventus in front of a capacity 39,000 fans at Allianz Stadium on Sunday - a record for a women's game in Italy. A week earlier 60,739 watched Barcelona beat Atletico Madrid at Wanda Metropolitano - a record for a top-flight domestic women's game in Europe. "The last two weeks have been a microcosm of what the future is going to be. "It is now about the clubs taking the step and doing it - marketing games, marketing it across social media and doing it and not being afraid." In May 2018, a bumper crowd of 45,423 packed Wembley Stadium to watch Chelsea defeat London rivals Arsenal 3-1 to win the FA Cup for the second time, the largest crowd for a domestic women's game in England in the modern era. "When women's football has been put on a huge platform in the last few years and has been marketed properly, people come out and watch as they would do in the men's game," Aluko told BBC Football Daily podcast. "We have been talking about it for so long and now we are in this place where Atletico v Barcelona is played in front of 60,000 people. "The appetite is there. The quality is there. The media interest is there." 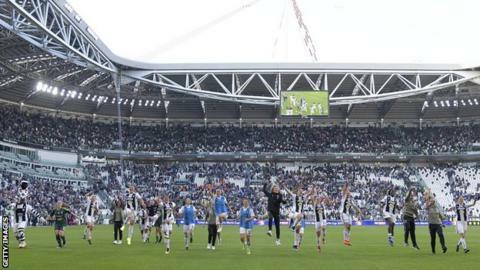 The game against Fiorentina was the first time Juventus Women had played at Allianz Stadium, the ground where the men's side play all of their home matches. Tickets were free and the attendance beat the previous record of 14,000 for a women's match. "Everything was the same as men," Aluko said. "I would hope next season, maybe in the Champions League or in another league game, we could do it again. "It was absolutely incredible to see a full house. "There were a lot of tears and emotion. "A lot of these girls, particularly Italian girls, grew up never thinking this could happen. "I have been lucky enough to play at Wembley four times with the national team, in the Olympics and with Chelsea. "I have been exposed to it but even I was overwhelmed."